Celebrated children’s poet and author, Michael Rosen, is on sensationally silly form in this new series for children. Young readers will be surprised to learn that in a time not so long ago, ‘DREAD SHEDS’ were prevalent in England and were frequently used to imprison and terrify naughty children! In this story, Malcolm and his friend are keen to avoid being locked up in the country’s last remaining dread shed. Sadly for Malcolm, his fiercely draconian uncle, Uncle Gobb, with whom he cohabits, is rather keen on the idea of dread sheds. In fact, he is strongly believes that all children should be harshly punished for even the slightest of things…it’s the only way they will learn! This means that Malcolm has to be extremely careful to be polite, courteous and respectful and to avoid such terribly rude activities as answering a question incorrectly or eating toast on beans instead of beans on toast. As Malcolm attempts to tow this super-straight line, he is confronted by a barrage of brain-baffling questions from school. 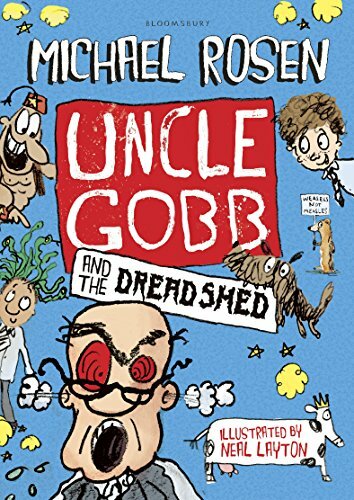 He soon notices that Uncle Gobb’s influence stretches far beyond his house – he is even messing with Malcolm’s worksheets and lessons at school! Malcolm isn’t the only one feeling confused. The author shifts constantly between narrating the story and chatting casually to the reader, the effect of which is totally chaotic and often quite hilarious. Just when readers might think things couldn’t get any queerer, magical genies begin emerging from characters’ noses! Rosen has wonderful empathy for children and understands entirely the torturous impact of boring worksheets and the panic that sets in when one can’t recall a correct answer. The series is bound to continue conjuring up comedy through this effective contrast of charming children and the bizarre grown-ups with whom they are forced to share the world.